Ratings: Zero to 4 Stars. 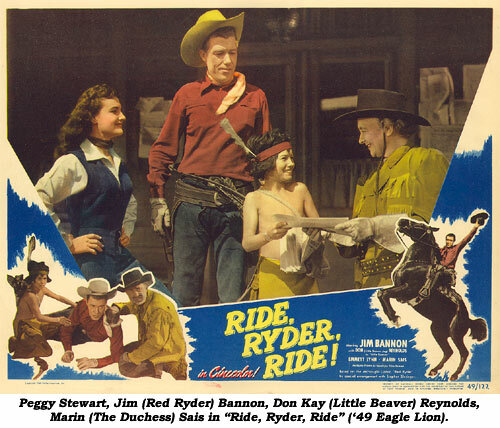 “RIDE, RYDER, RIDE” (‘49 Eagle Lion) Red Ryder (Jim Bannon) is pitted in a gun duel with crooked saloon owner Edwin Max. Bannon and this group of four Cinecolor B’s were closer in looks and concept to Fred Harman’s RED RYDER comic strip than any of the Republic versions (Elliott, Lane and certainly Barry). Bannon wanted the part so badly, he dyed his hair red to impress the producer, Jerry Thomas, and instantly got the role. Expert rider Don Kay “Little Brown Jug” Reynolds was Little Beaver, onetime silent actress Marin Sais was perfect as Auntie Duchess and Emmett Lynn was a hoot as Buckskin. Cinecolor added greatly to the productions…after all, this was “Red” Ryder—the color was nearly essential. Strip creator Fred Harman was consulted in order to keep the wardrobe for all the characters akin to the strip, something Republic had never really bothered with. 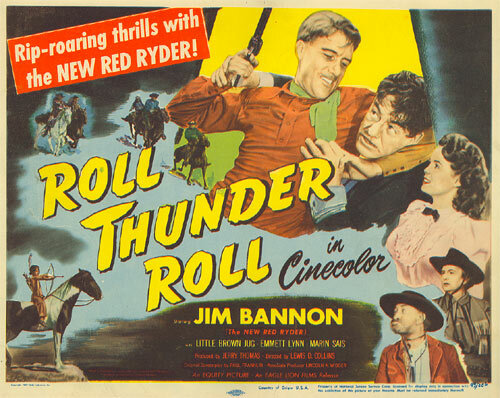 “ROLL THUNDER ROLL!” (‘49 Eagle Lion) Red Ryder helps a Mexican Robin Hood (overplayed by I. Stanford Jolley), who is being framed by saloon owner Glenn Strange for his banditry. 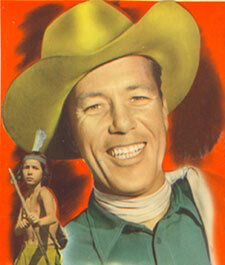 Bannon’s double is Rocky Shahan who later gained fame as trail drover Joe Scarlett on TV’s “Rawhide”. 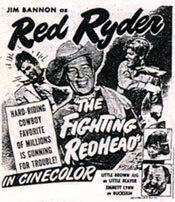 “FIGHTING REDHEAD” (‘49 Eagle Lion) Two fisted Red Ryder (Bannon) along with Little Beaver (Don Kay Reynolds) come to the aid of Peggy Stewart whose father has been killed by saloon owner John Hart and his henchmen. Dialogue heavy, this is the weakest of the four. As Auntie Duchess, Marin Sais was at the end of an illustrious film career stretching back to 1915. She’d once been married to Jack Hoxie. Peggy Stewart, a veteran of Republic Elliott and Lane Red Ryder features, is still a feisty leading lady for a 3rd screen Ryder. “COWBOY AND THE PRIZEFIGHTER” (‘49 Eagle Lion) Red Ryder (Bannon) and newfound friend Don Haggerty—expose a crooked prize fight promoter (John Hart) and his cohort, another sleazy saloon owner that B-westerns loved to portray, Marshall Reed. Haggerty’s father had been murdered earlier by Hart when he threatened to expose Hart’s illegal boxing practices with his fighter, Lou Nova. A real life heavyweight contender in the ‘30s and ‘40s, Nova ran for President as the “Poor Man’s Candidate” of the Utopian Party against Ronald Reagan in the ‘80s. 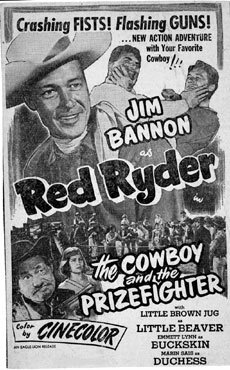 Bannon went on to do an unsold “Red Ryder” TV pilot (for another outfit), co-starred with Whip Wilson in five of his Monograms, starred on the Gene Autry produced “Champion” TV series (‘55-‘56) and guested on dozens of TV westerns as well as hooking up for a lengthy run on the NBC soap opera “Hawkins Falls” (‘50-‘55). Born April 9, 1911, in Kansas City, MO, Bannon died July 28, 1984.